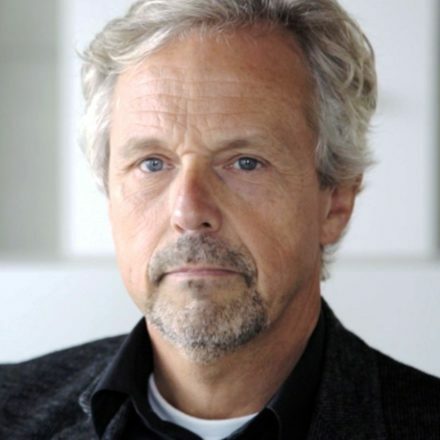 VOLA‘s founder Verner Overgaard, introduced the idea of revealing only the elegant parts of a product to the user. 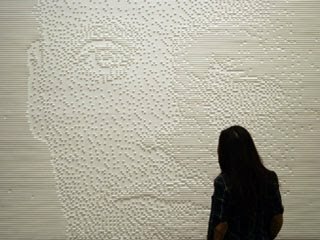 His designs carefully hide the mechanical parts in the wall. 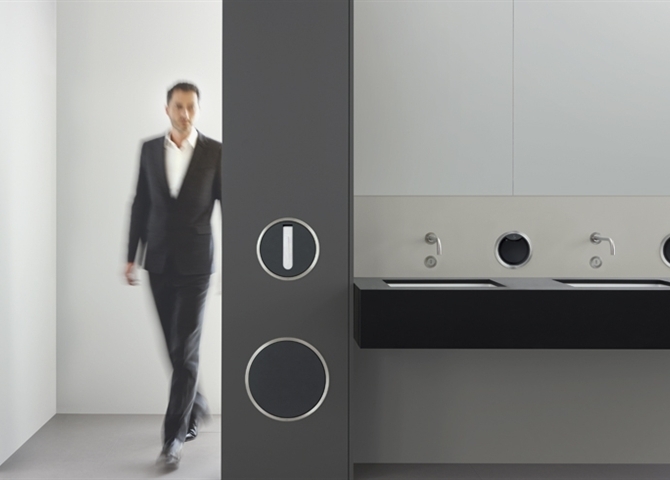 The electronic hands-free soap dispenser and cistern flush – designed by Aarhus Arkitekterne now make the washroom experience completely VOLA. VOLA‘s new products take the Round Series one step further. 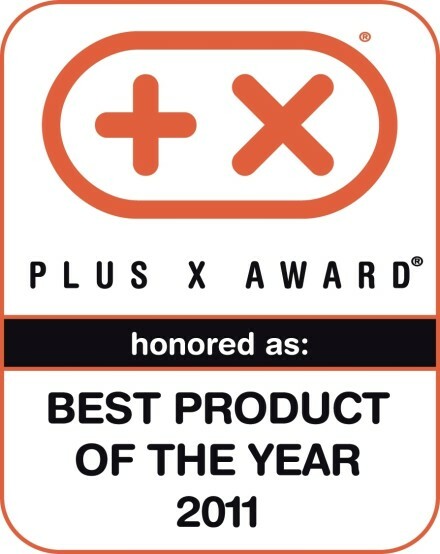 The result = Innovation that is both functionally efficient and aesthetically pleasing. 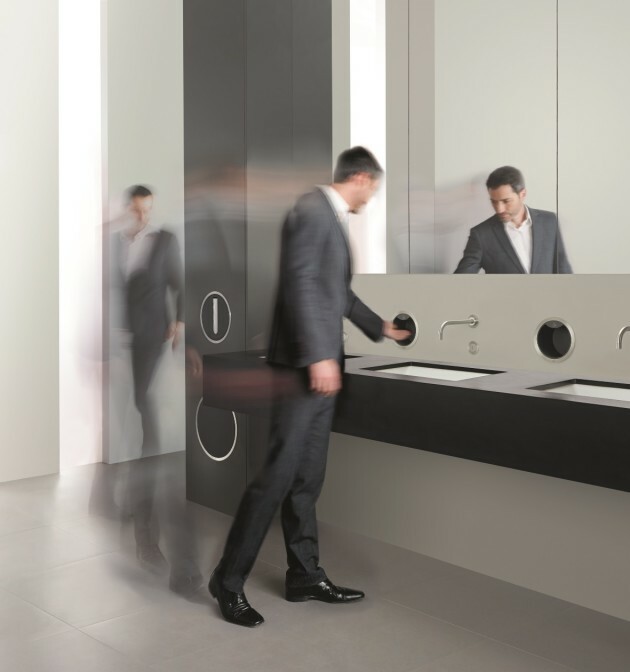 So now the smartest corporate offices, restaurants, hotel foyers, museums, galleries and concert halls can offer their washroom visitors the total versatility of VOLA. Like the other elements, the electronic soap dispenser and cistern flush are built-in and beautifully aligned to the wall. But they are also completely contact-free, using the latest technology to provide a totally clean and relaxing experience. In a public space purity and hygiene are essential. 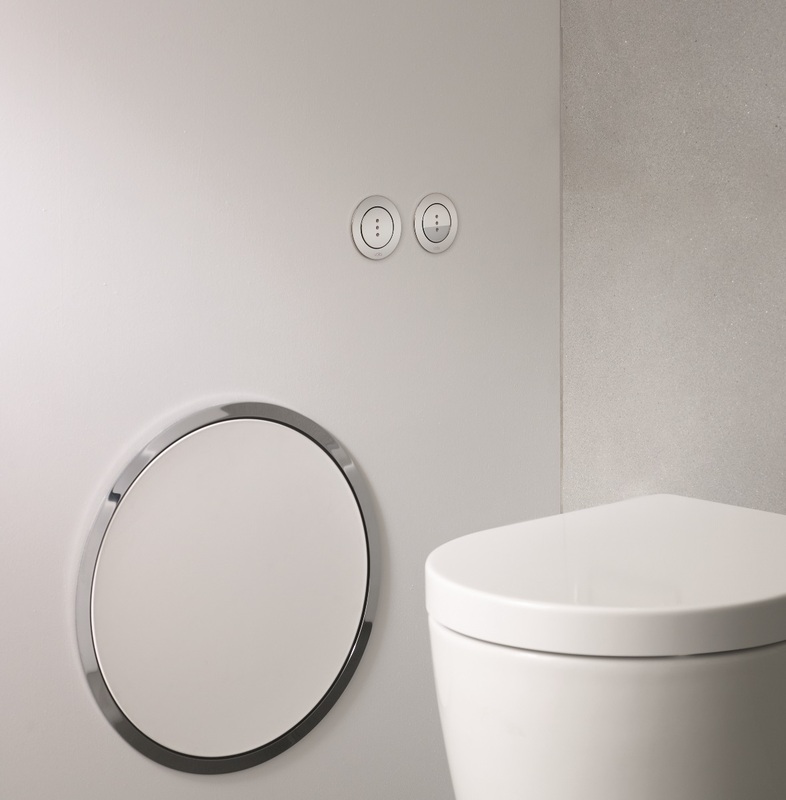 The Round Series for the luxury washroom already features the built-in waste bin and the built-in tissue dispenser. 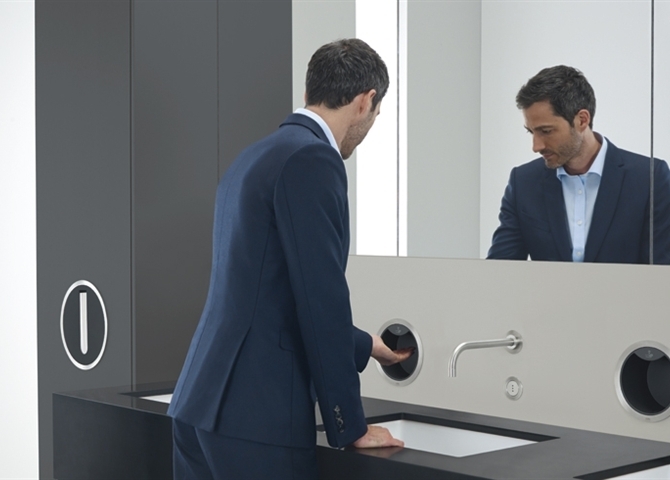 Now together with the classic VOLA hands-free tap and electronic cistern flush, the new soap dispenser takes the outer circle as the core of its design and translates it into a highly innovative product. 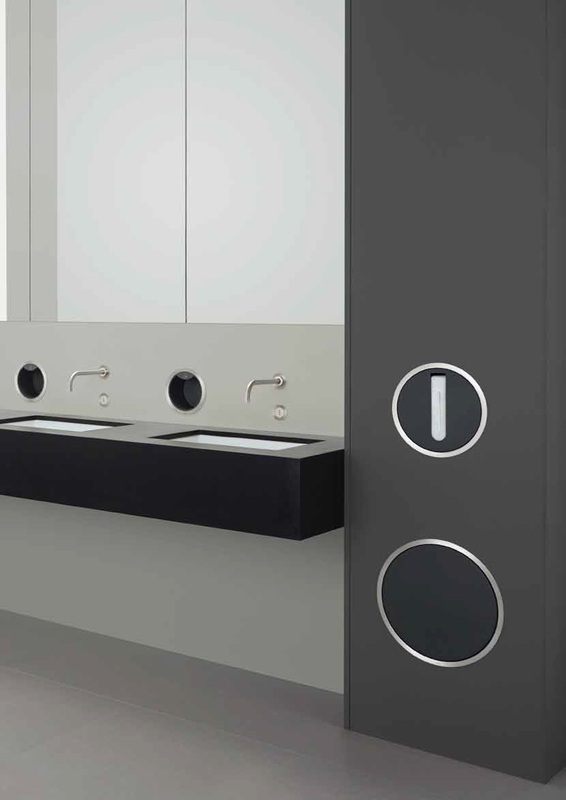 The modular nature of the VOLA washroom means customers can combine any products – choosing their finish, colour and functional details – to create a co-ordinated and cohesive space. 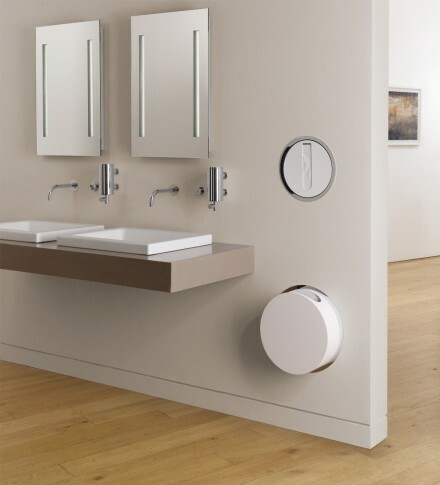 The complete VOLA hands-free set of products is pure, compact, water-saving and effortlessly beautiful. Vola RS10 – Its smooth inner section comes in elegant black or white. As a key element of the Round Series, the electronic soap dispenser is based on the soothing VOLA circle. Echoing the other products, it is aligned to the wall and the circular rim is available in several finishes: polished chrome, brushed chrome, polished brass, stainless steel and 15 different colours. 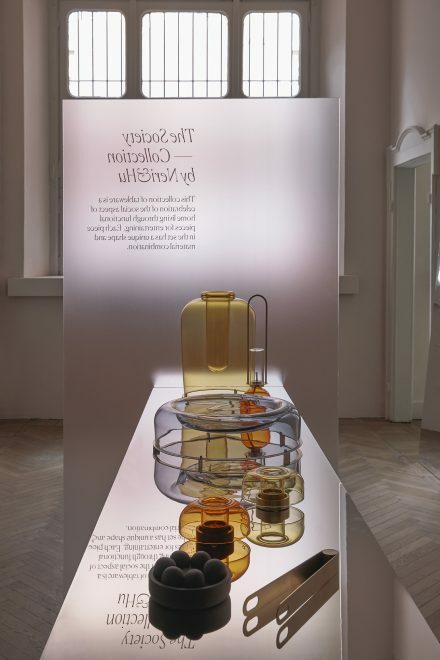 However for VOLA aesthetic beauty is not enough, they take pride in functional innovation too. 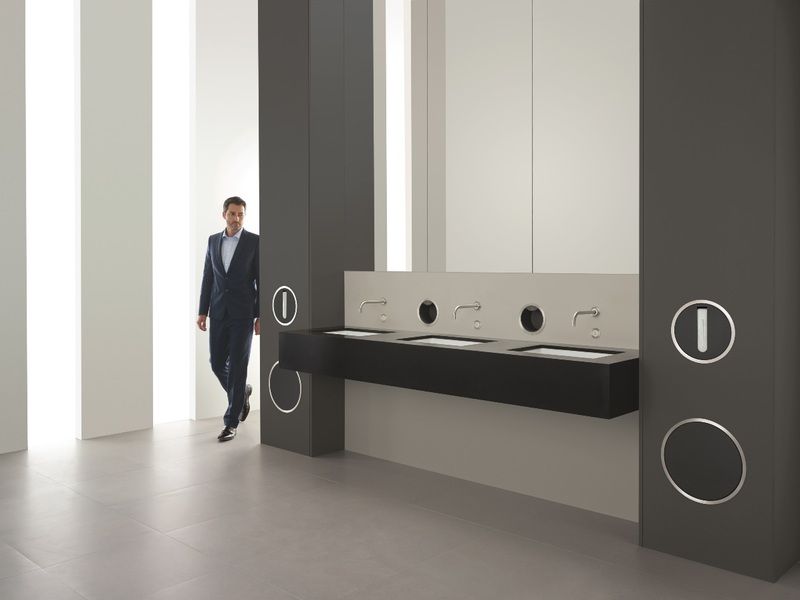 Since VOLA is all about the customer, the dispenser illuminates on entry to welcome the user. The electronic soap dispenser is available with either soft crème soap or foam. For the crème soap option, there are four different pre-set soap volumes to cater for customer preference. The volume dispensed can be adjusted by maintenance staff. The sensor response distance can be adjusted by maintenance staff with the simple turning of a screw. 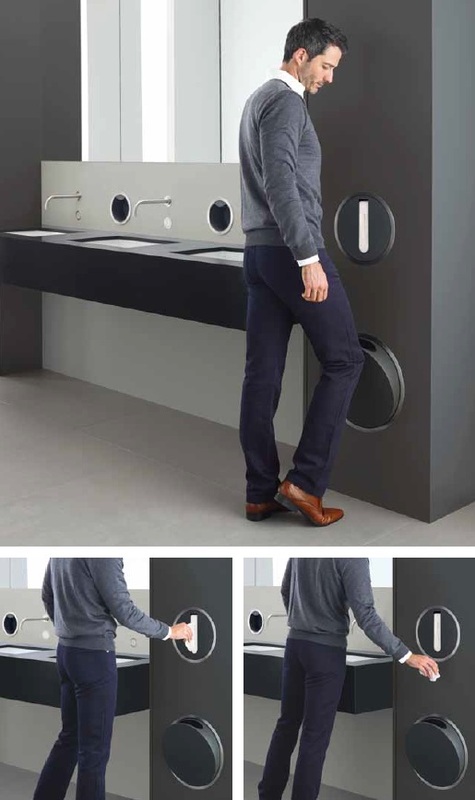 The dispenser’s built-in design is space-saving and keeps the washroom spotless. The soap dispenser is very easy to maintain. The refill bag (for foam soap) is simple to replace using a push release button. No VOLA washroom is complete without the legendary VOLA tap. 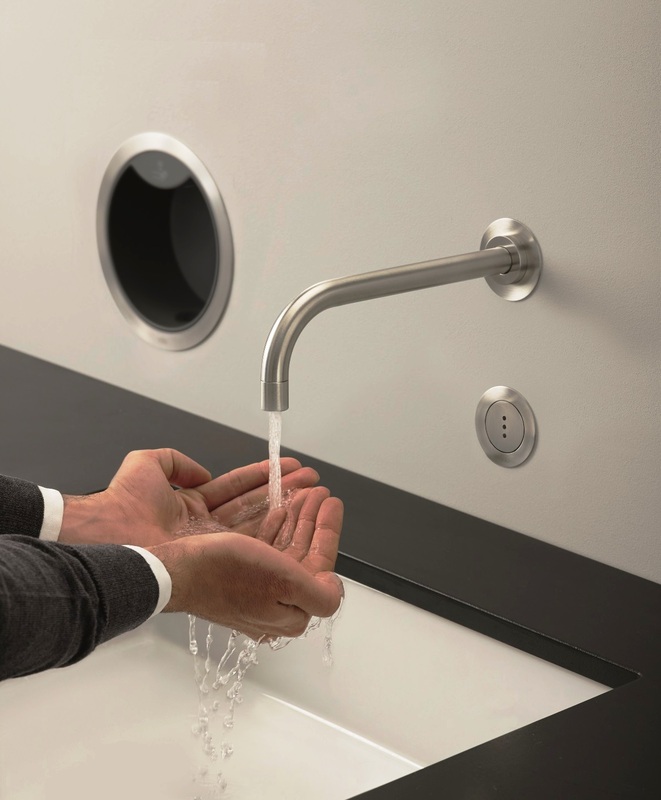 VOLA electronic taps and mixers for hands-free operation save water and secure high hygiene.And since evolution is part of Vola’s culture, they have redesigned the hands-free sensor to be aligned with the wall. The new design is more responsive too. No sooner does it sense a hand under the tap than it activates the water flow. The temperature is user-friendly from the start. 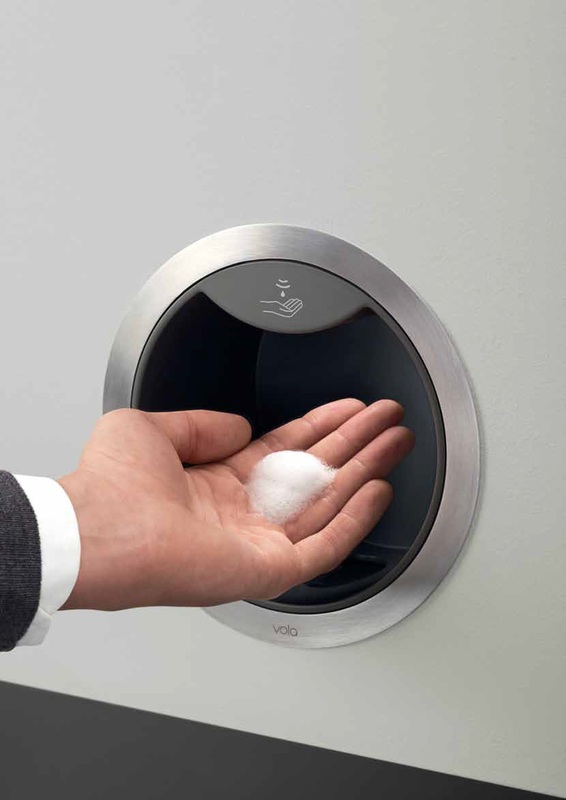 The existing VOLA paper tissue dispenser, RS2 and waste bin, RS1 are important elements in the Round Series executive washroom. The paper tissue dispenser’s circular rim encloses a cylinder holding the tissues. A concealed spring makes sure the tissues are always pushed to the front. The unobtrusive waste bin is opened by gently pushing the front with a hand or knee. Its mechanism is smooth and silent. 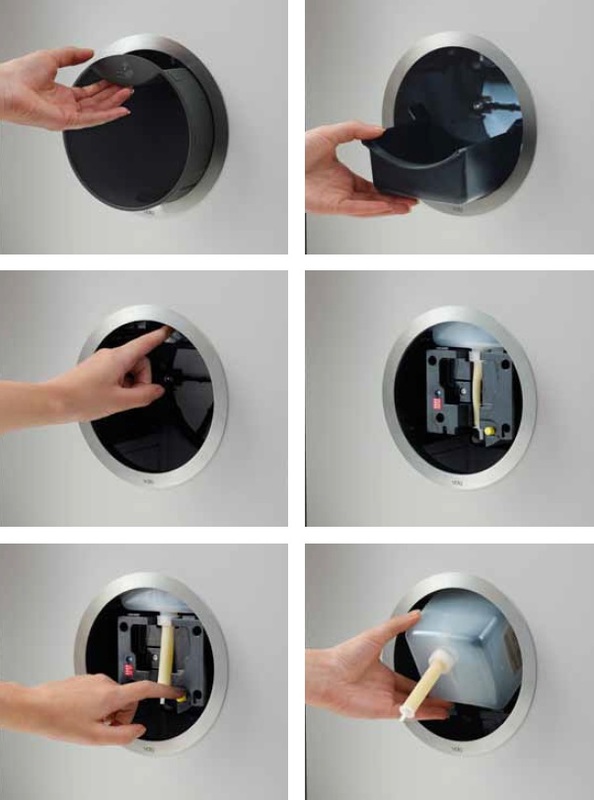 The bin is simple to empty and its built-in style makes cleaning effortless. 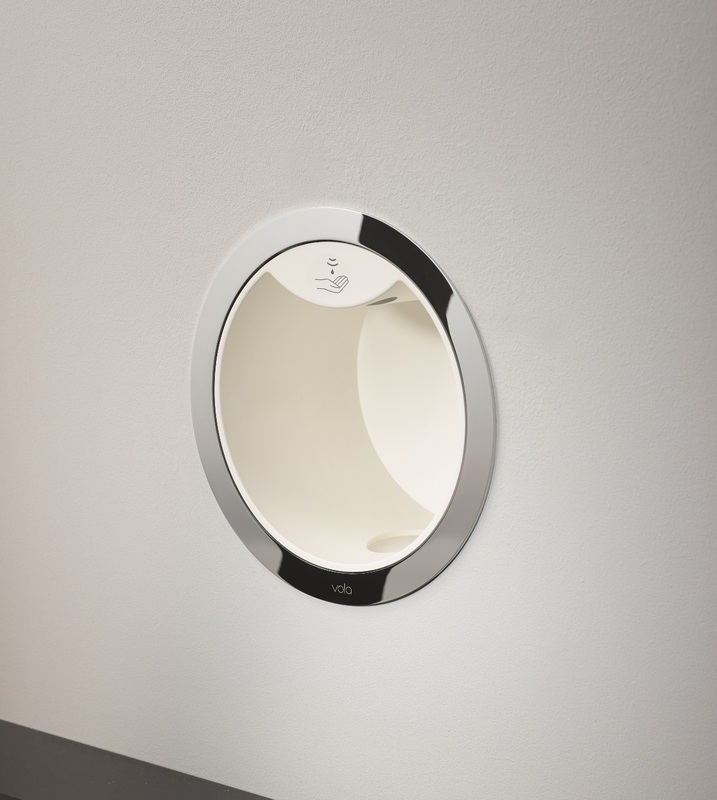 Like the soap dispenser, the brand-new VOLA cistern flush is elegantly aligned to the wall and totally contact-free. 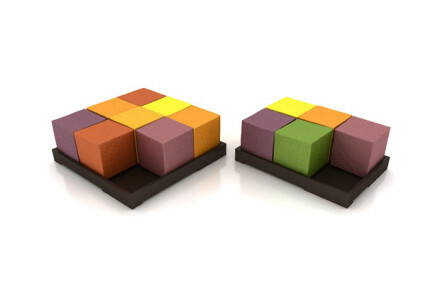 Two sensors, each contained in an understated circular design, sit side by side. One for a full flush, the other for a water saving half flush – using the classic design language half circle. Alternatively, there is a single sensor option for full flush only. 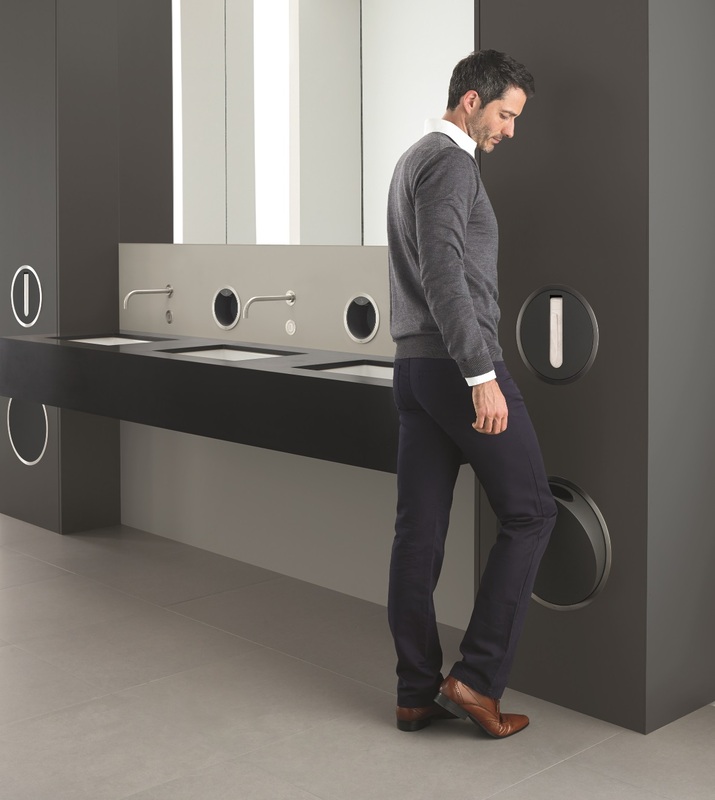 Since technical perfection is as important to VOLA as aesthetics, every detail is carefully thought through – ease of installation, hassle-free maintenance and the simple convenience of the visitor. For more on installation and maintenance technical details and short videos are available from dedece. 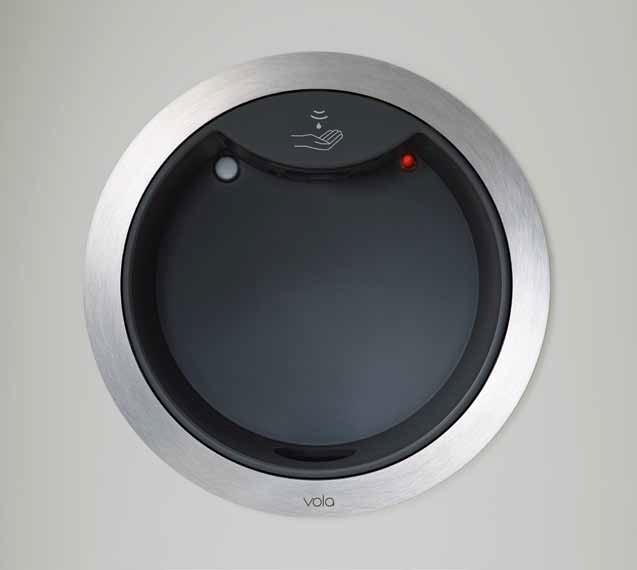 VOLA takes pride in the continuity of their design language. 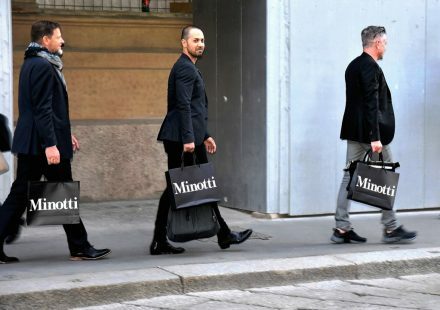 But they also celebrate novelty and innovation with each new product. 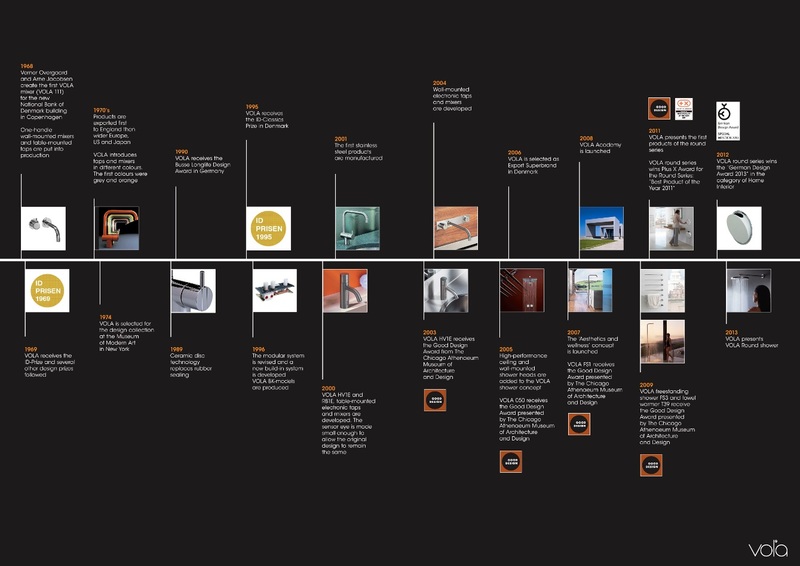 More than forty-five years since the first VOLA tap was born, our designs are still receiving recognition from the industry. 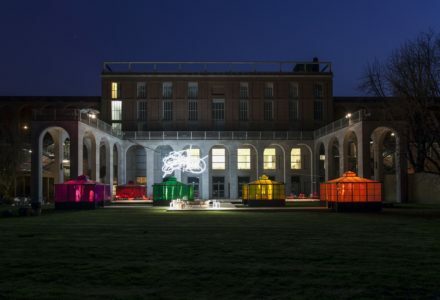 Vola celebrates change & celebrates continuity. 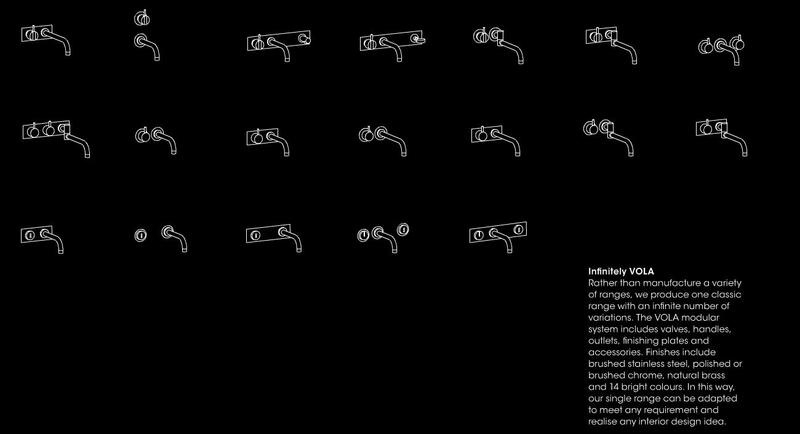 Shortly after Arne Jacobsen won a competition in 1961 for his design of the National Bank of Denmark he was contacted by the owner of VOLA A/S, Verner Overgaard who introduced his proposal for a new type of wall-mounted mixer tap. He imagined a design where all the mechanical parts of the mixer are hidden leaving only the handles and spout exposed. At the time this was a completely new concept, but Jacobsen realized that this idea combined with his functional approach to design could be developed. With that basic principle in mind, it was conceived the simple and concise VOLA design that we know today was conceived. Since Jacobsen’s death in 1971, Teit Weylandt, one of Arne Jacobsen’s former assistants, and later on the design department of Aarhus Arkitekterne A/S along with VOLA Director Carsten Overgaard continue to introduce new products into the world of the famous VOLA range. Thus establishing VOLA as an international brand whilst keeping the original principles of excellent design and functionality. Aarhus Arkitekterne A/S is a Danish architectural firm with offices in Aarhus and Copenhagen. With its around 60 employees it is among the 15 largest architectural firms in Denmark. One of its main fields of activity is the building of hospitals in Denmark as well as abroad. 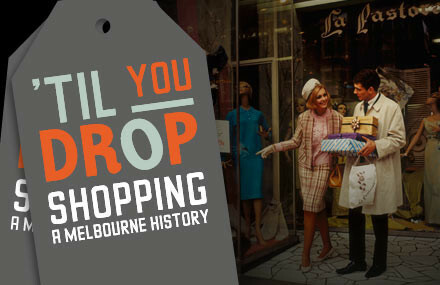 Town halls, concert buildings, schools, shopping centers, and domiciles are included on their reference list as well. Aarhus Arkitekterne A/S designed the VOLA head quarter in Horsens in 1999 and extended the building in 2003. 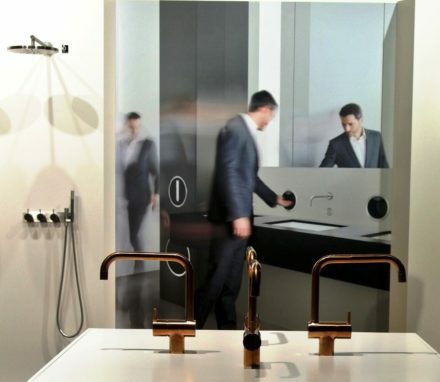 They also designed the VOLA showroom in Amsterdam in 2005, the VOLA showroom in Vienna in 2007 and the VOLA International Studio in London in 2009. The new VOLA academy in Horsens is also designed by Aarhus Arkitekterne A/S. The design department of Aarhus Arkitekterne A/S supports and compliments production of building architecture of the firm, but it also develops product ranges for industrial customers. 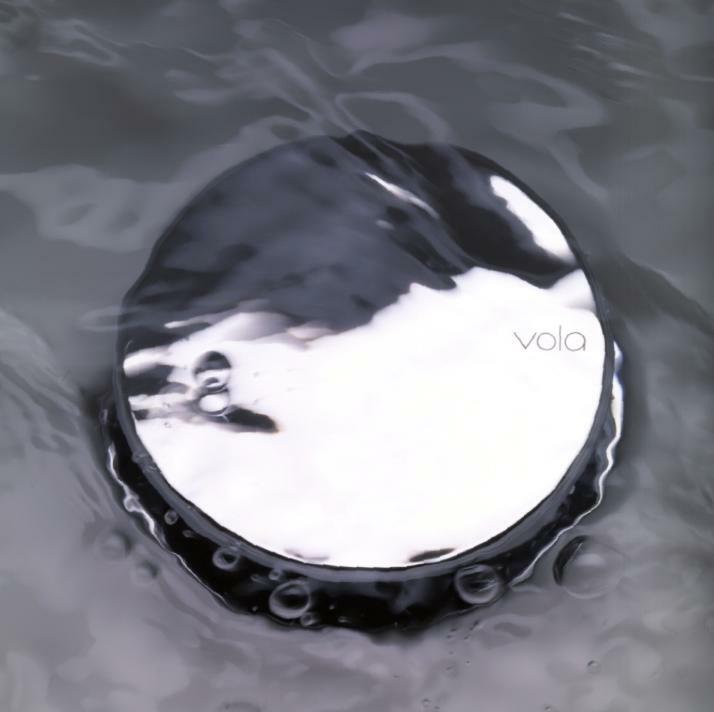 In 2006 the design team of Aarhus Arkitekterne A/S designed the floor-mounted mixer for VOLA. Then in 2008 they designed the free-standing mixer FS2, the free-standing shower FS3 and the towel warmer T39.